Here is a fun fact about winters at Fairbanks Princess Lodge. I live about 7 miles from the Lodge. In the summer it takes me about 10 minutes to get to work. Fairbanks Princess Lodge is located on the banks of the Chena River. During the winter months after the river freezes and it’s a mild 20 below outside, I and many other Fairbanks residents drive across the river to get to and from work, this saves me 5 minutes in driving time! 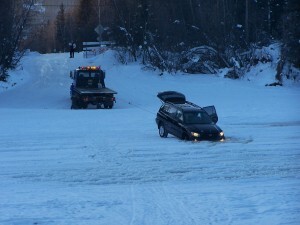 Although every winter there is the one car that tries to make the last trip over the river for the winter that falls through the ice. We have a first class view of this event every year from the lodge. The ice bridge is located directly in front us. Thankfully no one has been hurt. Unfortunately insurance doesn’t pay for automobiles that drive on water.